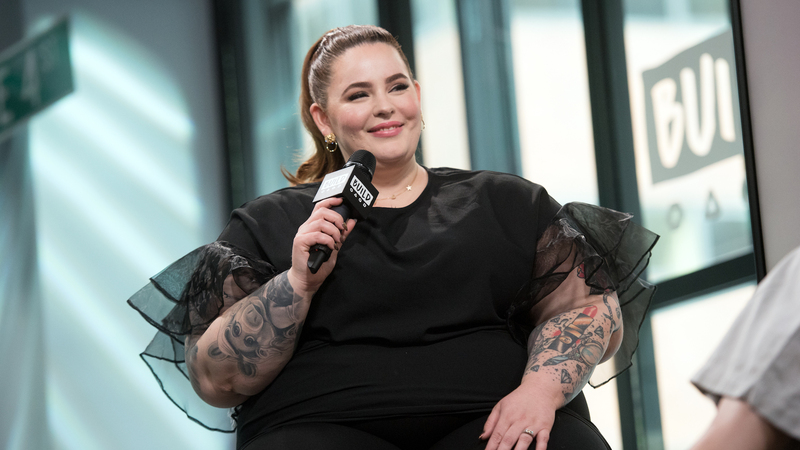 Tess Holliday is outspoken about many things: From body image to motherhood, there isn't much the model won't speak about, and this week, she opened up to Cosmopolitan about her struggles with postpartum depression. Holliday gave birth to her son, Bowie, in June 2016, but she didn't begin experiencing the symptoms of PPD until January 2017. According to Holliday, "[I]t felt like the water was boiling over and things were coming to the top again," and this feeling didn't go away. In fact, Holliday struggled with postpartum depression well into the spring of 2018. "I remember very vividly driving in the car with Bowie and I thought to myself, 'I wish I could just disappear," she told Cosmopolitan. "I wish I could vanish.' It felt at that point like I was causing everyone around me so much pain. It felt like a never-ending black hole. I was so tired of hurting… I just didn’t want to be here any more." "I’m grateful to have support in my life, friends to talk to, but it got so bad that I had to take action & by doing so it potentially saved my life…I guess what I’m saying is, moms/parental figures: you have to take time to care for YOU. Don’t let it get to the point mine did where you feel like you’re losing your mind. Don’t think because your child isn’t a 'baby' that you couldn’t still be suffering from PPD, because I’m here to tell you, you most definitely can. Ask for help, talk to someone, find a support group or hell, message me. You aren’t alone & you don’t need to suffer alone." And Holliday is right. You are not alone. According to the American Psychological Association, 1 in 7 women will experience some sort of perinatal/postpartum mood disorder. As such, it is important to know the symptoms — which include sadness, anxiety, irritability, changes in eating and/or sleeping behaviors and scary racing thoughts to name a few — and to know how to get help, i.e., talk to your friends, your family, your doctors. Talk to anyone who will listen. Because there is help. There is hope, and you are worth it.